The Gold Lion Wakizashi mirrors the materials, fit and finish of its larger brother in every way except size. It’s equally light and fast, and with the same high-quality materials, but at a fraction of the size, making it an exquisite companion piece to the Gold Lion Katana, or a beautiful stand-alone blade in its own right. 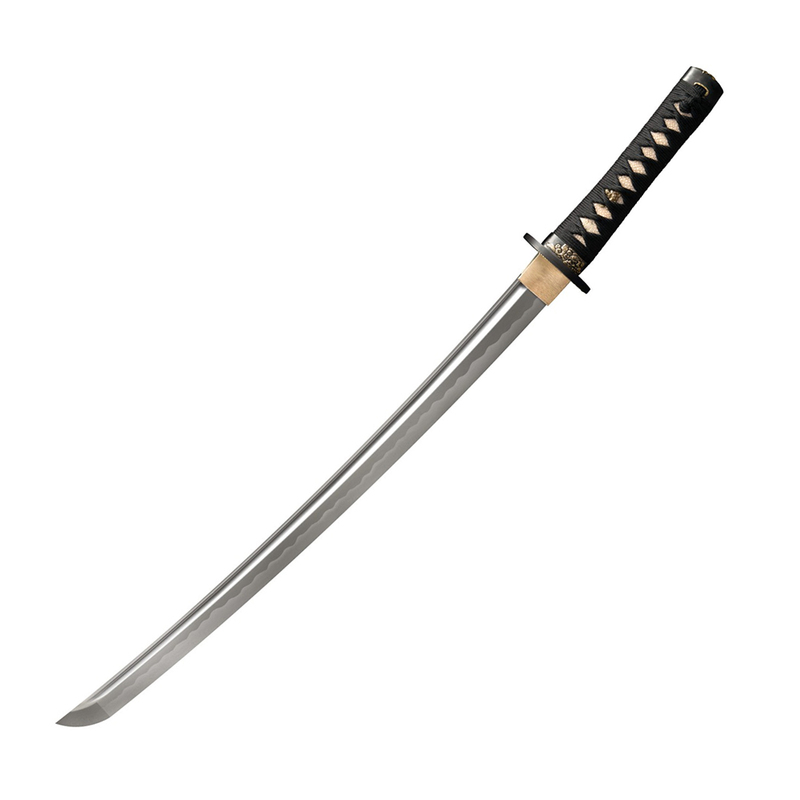 The Cold Steel Gold Lion Katana represents a Samurai’s “every day carry sword” for personal protection, and the defense of his Lord, his family and his home. Significantly lighter than some of our other heavier-duty Katanas, it is not only faster in-hand, but easier and more comfortable to carry when tucked into an Obi and worn all day. The Katana’s Menuki bears the symbol of the Japanese Shisa (Lion Dog) a guardian or protector – a fitting motif for this beautiful lightweight sword. Measuring just under thirty inches, the Gold Lion Katana’s blade is made from expertly hand honed and highly polished Damascus steel, with an Hamaguri grind, peaked Lori Mune spine and undulating clay-tempered Hamon. The black iron Tsuba, Fuchi and Kashira all have gleaming 24 carat gold leaf accents and the handle features white ray-skin and a black silk cord wrap. 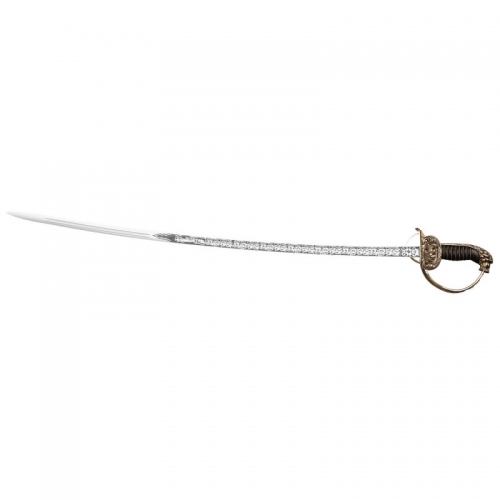 The Gold Lion Wakizashi mirrors the materials, fit and finish of its larger brother in every way except size. 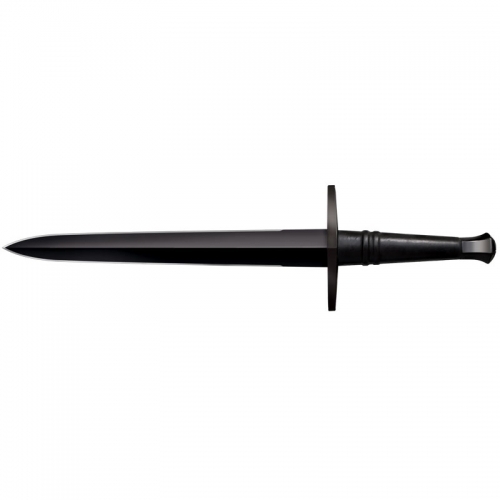 It’s equally light and fast, and with the same high-quality materials, but at a fraction of the size, making it an exquisite companion piece to the Gold Lion Katana, or a beautiful stand-alone blade in its own right. PART # 88ABW WEIGHT 22.4 oz. 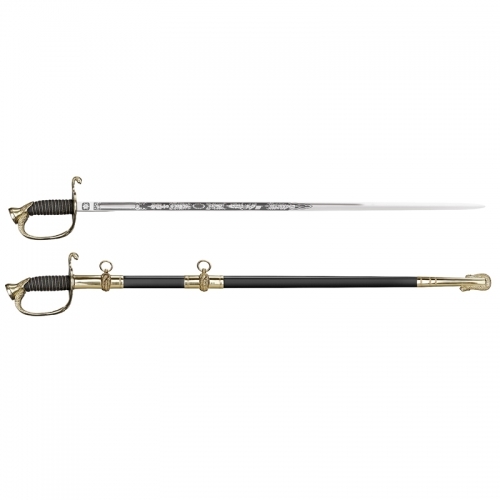 THICKNESS 6mm HEAD No HAMMER FACE No PRIMARY EDGE No HAWK LENGTH No HEIGHT No BLADE LENGTH 21” HANDLE 7 1/4″ STEEL/MATERIAL Damascus OVERALL 28 1/4″ ADDITIONAL FEATURE Black Lacquered Wood Scabbard. Samé (Ray Skin) Handle with Black Braid Cord and Brass Menuki.